Mitt Romney's rude and inappropriate questioning of British readiness for the Olympics, while a guest in that country, is yet another example of how very ill-equipped he is for the presidency of the United States. The boorish lack of class reminds one of the incumbent president America is so eager to replace. The Republican Party has far better than Romney among its ranks, and under party rules delegates are free to vote their consciences on the first and all ballots at the convention. It is not too late for GOP leaders to intervene and ensure that, in a time of crisis, the very best choice is offered to the American people. The prime minister has hit back at comments from the US presidential candidate Mitt Romney querying Britain's readiness for the Olympics, urging the country to "put its best foot forward" and ensure they are remembered as "the friendly Games". 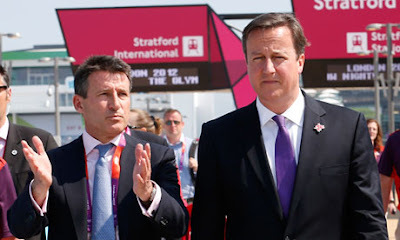 On a visit to the Olympic Park with the London 2012 organising committee chairman, Lord Coe, before Friday's opening ceremony, Cameron said the Games were an opportunity to promote Britain despite the gloomy economic backdrop. "This is a time of some economic difficulty for the nation, everyone knows that. But look at what we're capable of achieving even at a difficult economic time. Look at this extraordinary Olympic Park, built from nothing in seven years," he said. But Cameron, who was due to meet Romney later on Thursday, said: "In terms of people coming together, the torch relay demonstrated that this is not a London Games, this is not an England Games but this is a United Kingdom Games. We'll show the world we've not only come together as a United Kingdom but are extremely good at welcoming people from across the world." Coe said more than 13 million people had now seen the torch relay, currently in central London on the penultimate leg of its 70-day journey around the UK. The prime minister, with an allusion to the 2008 Beijing Olympics, which London organisers have in some ways defined themselves in opposition to, said it was "not a state-run Games, it is a people-run Games." He said the 250,000 applications for 70,000 volunteer places, plus the 8,000 ambassadors recruited by the London mayor, Boris Johnson, also showed the enthusiasm of the British public. "It is about the people of the UK showing a really warm welcome and showing respect for all the teams and all the nationalities who come here," he said. Cameron, who had spent the morning at a trade conference and has claimed £1bn in extra investment will be attracted by the Games, also expanded on the view of Britain he hoped the Olympics would present to the world. "I think this is a big opportunity for Britain to put its best foot forward and say that if you want to start a business, come and visit. I hope people will see, yes, a great past, but also huge opportunities," he said. "We're at the cutting edge of technology. Think of Tech City a few miles from here. Think of pharmaceuticals and life sciences. I hope people will see a modern and vibrant country as well as celebrating the best from our history. It is a great moment to celebrate that." Asked whether the Games and Danny Boyle's opening ceremony, which will be watched by a predicted 1 billion people, offered an opportunity rebrand the country, Cameron said: "We don't need to rebrand Britain. Britain has a great brand. I hope people will see all the things they like about Britain's past, our history, our contributions to world development. But I also hope they will see a very open country and one that has an enormous amount to offer for the future." In the wake of calls from Barack Obama and others for a minute's silence at the opening ceremony to mark the anniversary of the Munich Olympics tragedy, in which 11 Israeli team members were killed by Palestinian gunmen, Cameron said it was not the right forum in which to remember the deceased. "It is right that in 2012, 40 years on from the Munich Olympics, we remember the Israeli team members who were killed there. We'll be properly marking the anniversary of that tragedy with a special commemoration and demonstrating there is no more diverse, more open, more tolerant city in the world than this one," he said.